Updates on construction and project milestones. Go to our electronic notifications menu to sign up for Swan River Restoration Blog posts via text or email. Annual Update to the Summit County Board of County Commissioners (BOCC): One of the conditions of Summit County’s gravel milling permit (Conditional Use Permit) requires annual project updates to the BOCC. The Summit County Open Space and Trails Department (OST) will be providing its third annual update to the BOCC at a worksession scheduled for Tuesday, April 2nd at 9:00 a.m. in the Commissioners’ Hearing Room in the County Courthouse in Breckenridge. OST will review accomplishments from 2018 and discuss plans for the 2019, including continued gravel removal from the valley. As always, your attendance at these meetings is welcomed. Please do not hesitate to contact OST with any questions, or comments about this meeting. Enhanced Groundwater Monitoring: During early March, OST, in coordination with the County’s ecological engineering consultant, Ecological Resource Consultants (ERC), and gravel removal contractor, Schofield Excavation, installed eight piezometer wells on the Reach B site. Over the next several months, OST will be closely monitoring groundwater elevations across the site, which will provide critical information required for finalizing the elevation and alignment design of the new stream channel. This information will also help in optimizing the final grading and gravel removal plan for the Reach B site. Reach A Monitoring: In 2018, Summit County received a Colorado Water Conservation Board (CWCB) Watershed Restoration Monitoring Grant. Utilizing this grant funding, ERC performed their first comprehensive post-construction monitoring of several site parameters including, the new channel, soil and plant development, and habitat development. Recent results indicate that all measured parameters are performing extremely well, with the new channel responding appropriately to new flows, soils and plant materials becoming established, and stream habitat (e.g., riffles, pools, stream bed substrate, etc.) functioning and developing as intended. Additionally, a fall 2018 fishery survey conducted by Colorado Parks and Wildlife aquatic biologist, Jon Ewert indicates a very healthy fishery is becoming established in the new Swan River channel! Restoring Reach A Site Access: It has always been a project goal to provide public access to a restored Swan River channel. Post-construction, the site was extremely fragile as the new channel and vegetation became established across the site. This year, we are planning to scratch in a new trail through the Reach A restoration area and, with a little help from Mother Nature (cross your fingers for more typical moisture this season), reopen the site to the public. We will be sure to make an announcement via this blog if/when public access is restored in 2019. Keep in touch; it is shaping up to be another exciting year for the Swan River Restoration Project! Additional information about Swan River Restoration Project is available at RestoreTheSwanRiver.com as well as on the Open Space and Trails Special Projects web page. If you have additional questions about the restoration project, you can contact Summit County Open Space and Trails Director Brian Lorch, or Open Space and Trails Resource Specialist Jason Lederer, or call 970.668.4060. As we close the books on 2018, we are reflecting on another successful year for the Swan River Restoration Project. The past year saw the completion of work on Reach A and the continuation of gravel removal from Reach B. Overall, the project site fared extremely well during its first full year following the completion of major work. All major stream channel features, including pools and riffles, as well as the streambed and banks remain in good condition after two runoff seasons. Minor channel adjustments including erosional and depositional features, such as point bars, are forming as anticipated. The formation of these features mimics normal processes found in any natural high alpine stream. Upland and riparian plantings also fared extremely well over the last year. Willows are becoming well-established, shooting down roots during their first growing season and stabilizing the banks. Soon, the willows will transfer their energy to upward growth after their “feet” are firmly planted deep in the water. Trees are also becoming well-established across the Reach A site. Only one tree – a Colorado spruce – died during the first full growing season. This is an excellent success rate among the more than 100 trees planted across the site in 2017. The low mortality rate is likely largely due to selecting specially adapted trees from high elevation nurseries, as well as frequent irrigation during the unseasonably dry and warm summer. The lone tree that did not survive still provides habitat for birds, as a nest is found among its branches. Working with Western States Reclamation, we also addressed a few areas of the site where vegetation was not establishing as vigorously. Most notable was a relatively steep, south facing slope where soils were amended to better support plant growth. An additional two acres of the site received a seed and fertilizer application during late summer. During September, when many of the native grasses in the area were going to seed, the Summit County Community Development department hosted an internal volunteer day where native seeds were collected near Horseshoe Gulch (Tiger Dredge trailhead) and transported upstream to the Reach A site. Seeds collected from plants growing in the same general area as the restoration site are genetically adapted to the unique conditions of the Swan River Valley and have a higher likelihood of successfully germinating on the site compared to native seed species harvested from elsewhere (e.g., a seed farm). Additionally, many of the seeds collected locally are either unavailable commercially, or extremely expensive to purchase. These types are volunteer efforts are extremely helpful in generating a diverse, native plant population across the site. Gravel removal work also continued on Reach B during 2018 (above/upstream from the recently completed Reach A restoration site). Schofield Excavation initiated gravel removal in mid-April and over the summer/fall, removed approximately 75,000 tons of gravel. To date, nearly 260,000 tons of gravel have been removed from the site since work started in earnest in 2016. We estimate that the total amount of gravel removed to date represents approximately 75% of the total amount required to be removed before restoration work can occur on Reach B. In addition to gravel removal, Schofield Excavation continued to import clean soil, a critical material for completing riparian and upland restoration work. Schofield Excavation will process gravel throughout the winter of 2018/2019, but removal operations have ceased for the season. Gravel removal will resume in 2019 as conditions allow and material demand permits. 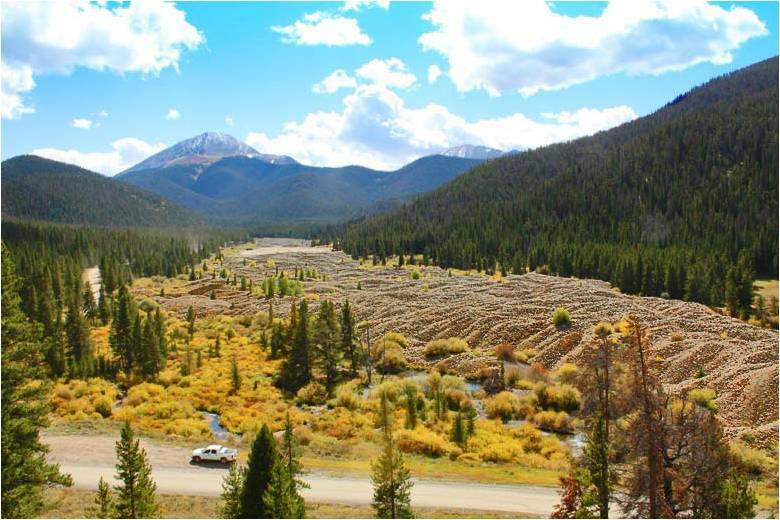 During October of 2018, the County coordinated with Colorado Parks and Wildlife (CPW) to conduct a fish survey both within the Reach A restoration site, as well as downstream. This is the second year CPW has collaborated with Summit County to survey the new channel, which coincides with the local trout spawning season. Formal survey results for 2018 will not be available until 2019, but initial observations indicate a healthy fishery is becoming established in the new channel. This will be the last blog post for 2018, but we will resume posting updates in 2019 as activity begins to ramp back up. Additional information about Swan River Restoration Project is available at RestoreTheSwanRiver.com as well as on the Open Space and Trails Special project webpage. If you have additional questions about the restoration project, you can contact Summit County Open Space and Trails Director Brian Lorch, or Open Space and Trails Resource Specialist Jason Lederer, or call 970.668.4060.
activities on the Williams Placer open space parcel, and proposed activities on the adjacent privately owned Mascot Placer, the Open Space and Trails Department will be providing a brief update on the Swan River Restoration Project as it relates to ongoing crushing and hauling operations. All meeting materials are available on the Summit County website and all are welcome to attend. If you have any questions, please contact Jason Lederer in the Open Space and Trails Department at 970-668-4213, or Jason.Lederer@SummitCountyCO.gov.